Trident submarines or Ohio class is named after the lead submarine of this class, the USS Ohio. 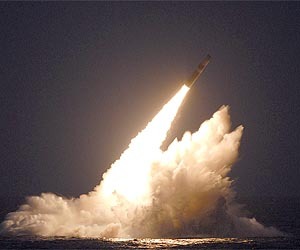 The 14 Trident II SSBNs together carry approximately fifty percent of the total US active inventory of strategic thermonuclear warheads. The Ohio-class submarines carry more missiles and warheads than any other design: up to 24 submarine-launched ballistic (Trident) missiles with multiple independently-targeted warheads per boat. The Trident missiles have no pre-set targets when the submarines go on patrol but when required, are quickly assigned the appropriate targets. Trident submarines do not need be where the enemy is, they just need to know strategically where it is. When a Trident missile is needed the trajectory is given, the missile is launched, and the target is hit. Soldiers are on the ground fighting hand on hand combat but when needed and the word given a Trident submarine can launch a Trident missile and completely wipe out the enemy at their exact location. The rest of Ephesians 6 breaks it down to what our enemy is, and the armor of God we have, to come against that enemy. But first and foremost we need to realize where our strength comes from. We need to observe that we are to be strong in His mighty power. The word strong comes from the Greek word endunamao. En means in and dunamis means explosive strength, ability and power. When we see the word dynamite we have an idea of what kind of explosion can come from that. Dunamis is where we get our word dynamite and gives us an example of the kind of strength we have access to. But it is not our own strength or power; it is God’s power at work in us, through the Holy Spirit. The good news is that the Holy Spirit teaches us everything we need to know – if we’ll listen to Him, cooperate with Him and allow Him to do what He was sent to do. With that understanding of His mighty power we must learn to take the Holy Spirit’s advice and follow Him completely, taking each of our cues from Him. He must become our heavenly coach, and we must learn to accept His leadership and be willing to yield to His divine guidance with no objections. We can be sure when He puts a thought in our heart to do something, it is right. When He puts an idea in our mind, it is a right idea. When He nudges our heart to do this or that, it is because He sees and knows something we do not know and, is trying to guide and direct us. He is always the Spirit of Truth, and as the Spirit of Truth, we can be sure that He will never mislead us. The Holy Spirit sees what we cannot see and knows what we cannot naturally know because He can be everywhere at all times, just like the Trident missile can be launched from anywhere, anytime. When we listen, the Holy Spirit will speak to us in ways that are life-changing. He is putting thoughts and ideas in our heart and mind constantly, but we may not be aware it is the Holy Spirit trying to guide and direct us. When the Holy Spirit drops a thought into our mind to do something, there is a reason He wants us to do it. When He tells us something will work, it will work. When He gives us instruction, it is because He is trying to help us. We cannot know what to do, where to go, whom to go with and when to go there without the guidance and direction of the Holy Spirit. We also see that He can lead us in two ways – by yes or by no! He will try to stop us from doing something that looks good to us but is either a trap of the enemy or not God’s will. He will open a door of opportunity and give us total peace to walk through it, or He will give us guidance when everything round us doesn’t seem to fit with direction God had given us. He will reveal to us how to think, what to say and what to do about a matter. He may even be warning us of an attack of the enemy. Whatever the Holy Spirit is revealing to us, we can be sure He will live up to His responsibility. He will come right alongside us and reveal to us everything we need to know to turn our problem into a victory. We need divine guidance and help to locate and handle all the fine little details and fiery darts with which the enemy is bombarding us. We need the mind of Christ to deal with these, and we have the mind of Christ when we are putting the full weight of responsibility upon our partner, obeying His instructions, saying what He says and doing what He does. When we understand who lives in us, how the Holy Spirit works, and the power He gives us we can soar with wings like eagles (Isaiah 40:31). Alone we can try all we want to fight and never win but, when the Holy Spirit works through us we can completely obliterate our enemy. Lord, it is clear that You want me to be filled with Your power and strength today, so I open my heart right now and ask You to fill me with Your Spirit. Thank You for creating me to be the receptacle for this wonderful power – and by faith, I receive a fresh infilling of Your Spirit right now! I pray this in Jesus Name. I declare by faith that I am filled with the Spirit of God. I am specially made by God to be the container of the Holy Spirit. He lives in me, He fills me, and He empowers me to conquer every attack that the devil tries to bring against me. God knew I needed this power and therefore gave it to me. I boldly confess that I am filled with the supernatural, wonder working, and dynamic power of the Holy Spirit! I declare this by faith in Jesus Name.